This is the student edition to accompany Teaching Fractions Using LEGO® Bricks and should be used in conjunction with that book. 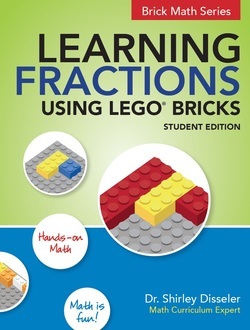 In Learning Fractions Using LEGO® Bricks: Student Edition, Dr. Shirley Disseler has developed activities that work to help students learn the basics of fractions, using a common toy available in most classrooms and homes—LEGO® bricks! The book starts with the most basic concepts and focuses on a specific topic in each chapter. Most students learn these concepts between grades 2 – 6.